Jakarta: A powerful earthquake shook Southeast Asia on Wednesday, collapsing buildings, killing at least 10 people and sending scores to hospitals in Indonesia. 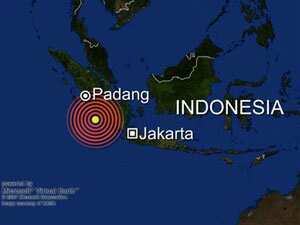 A small tsunami struck Sumatra, the island hardest-hit by the 2004 disaster, and nations as far away as Kenya put coastal regions on alert. The 8.4-magnitude quake could be felt in at least four countries, with tall buildings swaying as far as 2,000 kilometers away. It was followed by a series of strong aftershocks, further rattling residents. Phone lines and electricity were cut across a large swath of Indonesia, making it difficult to get information. Most of the damage, however, appeared to come from the tremor. Two people were killed when a car dealership collapsed and another person died in a fire on the fourth floor of a department store, a witness, Alfin, said by phone. Excavation machinery was being used to search through the rubble for survivors, he added. Seven people also were killed in and around Bengkulu, a town 400 kilometers away, social affairs department official Felix Valentino told the news portal detik.com. At least 194 people were injured, said Amin Kurnia, a doctor, noting that most were being treated in a compound outside the hospital because its walls were cracked. Frightened residents fled their homes and ran inland. “Everyone is running out of their houses in every direction," Wati Said said by cell phone from Bengkulu, just 130 kilometers from the quake’s epicenter. “We think our neighbourhood is high enough. God willing, if the water comes, it will not touch us here. Everyone is afraid." One witness, Budi Darmawan, said he saw a three-storey building near his office collapse. “I saw it with my own eyes," he told El Shinta radio. The undersea temblor hit at about 6:10 pm local time(16:40 IST), the US Geological Survey said, at a depth of just 30 kilometers. It could be felt in the Indonesian capital, Jakarta, 600 kilometers away, where office workers streamed down the stairwells of tall, swaying buildings. It also caused high-rises to sway in neighboring Malaysia, Singapore and Thailand. The Pacific Tsunami Warning Centre issued a tsunami warning for wide areas of the region, saying “earthquakes of this size have the potential to generate a widespread destructive tsunami that can affect coastlines across the entire Indian Ocean Basin." Alerts were issued as far away as Africa, with the Kenyan and Tanzanian governments telling people to leave beaches. Residents in one city were crowding into buses after hearing the warning over the radio. Police were moving people off the coastline. In Seychelles, authorities said they had downgraded a tsunami warning after the window for a strike had passed. “We do not really scare the people or get them to panic until we confirm something is coming," Head of Risk and Disaster Management Michel Vielle said. Indonesia — which issued two tsunami alerts, one after the most powerful aftershock, which had a magnitude of 6.6 — had lifted them hours later saying there was no longer a potential for a destructive wave. Thailand’s National Disaster Warning Centre sent cell phone text messages alerting hundreds of officials in six southern provinces, but later broadcast a statement on TV to reassure the public there was no danger. In India, officials said nothing was felt in the remote Andaman and Nicobar islands, some of which are just 240 kilometers north of the quake’s epicenter. But an alert was issued and local authorities were told to take precautions, said Dharam Pal, the regional relief commissioner. Sri Lankans were also told to move at least 200 meters inland. In Australia, the tsunami warning was lifted after only small rises in the sea level were measured at Cocos Island and the Christmas Islands. But officials warned residents to stay away from the ocean, warning that dangerous waves and currents could still affect beaches, harbours and rivers for several hours. Indonesia, the world’s largest archipelago, is prone to seismic upheaval due to its location on the so-called Pacific “Ring of Fire," an arc of volcanos and fault lines encircling the Pacific Basin. On 26 December 2004, a massive earthquake triggered a tsunami off the coast of Sumatra that killed more than 1,60,000 people in a dozen nations, most of them in Indonesia’s Aceh province. The 9.0 temblor was 29 kilometers deep, according to USGS.